Powers/Abilities: Black Racer can run at superhuman speeds; her maximum speed in unrevealed. While she has not evidenced superhuman strength, her musculature is at least such that she can clotheline people while running at those speeds and not break her own arms. (Captain America I#342 - BTS) - Viper (Madame Hydra) concocted a plan to invade the Serpent Society from within, and use its members to dump a mutagenic toxin into the drinking water of Washington D.C. She recruited Fer-de-Lance, Black Racer, Puff Adder, Copperhead, Coachwhip, Boomslang, Rock Python, and Slither to help her with this. (Captain America I#337) - In Las Vegas, Fer-de-Lance, Black Racer, Puff Adder, and Copperhead committed what was at least the second in a string of casino robberies. However, after an alarm was tripped they were forced to hole up in a casino penthouse. The Captain (Captain America under another identity), Falcon, D-Man, and Nomad invaded the penthouses and captured the quartet. (Captain America I#338) - The four Serpents were held in the same cell, opposite the vigilantes who'd captured them. Sidewinder teleported in and freed the snake-themed villains one-by-one. (Captain America I#341/2) - Sidewinder introduced the four new Serpents to the charter members of the Serpent Society, and appointed them as probationary members of the Society, with full status to be determined in three months time, and their first assignments to be given the following morning at 9AM. That evening Viper invaded the Society, and Black Racer aided in her takeover. (Captain America I#342) - Viper sent Black Racer to search the local hospitals for the escaped Sidewinder. She found him and Vagabond in an ambulance, but Vagabond defeated Black Racer by throwing her from the ambulance. (Uncanny X-Men Annual#13) - Cobra accepted a commission from Ghaur (Deviant leader) and Llyra (Atlantean) to retrieve items of arcane mystic power; he split the Society into squads. Cottonmouth, Rattler, Bushmaster, and Black Racer went to the Icelandic coast, seeking a mystic rock. They encountered several X-Men there and battled them as a team, with Psylocke taking down Black Racer after she was stunned by the Dazzler. The X-Men retrieved the item and the serpents returned home. (Captain America I#365/2) - Black Racer was present at a Serpent Society meeting when Cobra announced that a mystery man (Loki) had teleported into the Society's Bronx headquarters. He asked the group to keep an ear out for information about the stranger. (Captain America I#367/2) - Black Racer was present at a noon meeting of the Society where Cobra announced that he felt that he'd been underperforming as their leader and now intended to correct that and lead them to new heights as King Cobra. (Quasar#17) - Black Racer was gathered by the Elder of the Universe known as the Runner to compete in a "galactic marathon" race to the moon (384,392 kilometers) to determine Earth's fastest runner. Black Racer soon had second thoughts, noting that she was a sprinter rather than a marathoner. By about 49,000 kilometers she was firmly in last place and unsure if she could go another step. (Captain America I#379/2) - Under the radio codename "Streetwalker," Black Racer was ordered to follow Diamondback on the ground, and observed her while she exercised at her gym. Shortly thereafter, Diamondback was about to press a button for entrance into Avengers' Mansion. From a nearby limo, someone (presumably King Cobra) ordered Ariana to stop her; Racer knocked her unconscious and brought her back to the limousine. (Captain America I#380) - When Diamondback was tried by the Society for treason, Black Racer voted for her death. (Captain America I#381) - After Sidewinder freed Diamondback, King Cobra ordered Diamondback and Sidewinder's execution, with a doubled annual bonus to anyone who brought in their corpses. He ordered Black Racer, Rattler, and Coachwhip to Sidewinder's apartment. (Captain America I#382 - BTS) - After Diamondback invaded the Society's headquarters with Paladin, King Cobra had Black Racer and her two companions recalled. (Captain America I#382) - King Cobra led Black Racer, Coachwhip, and Rattler against Captain America, Paladin, Diamondback, Asp, and Black Mamba inside the Society headquarters; Asp blasted Black Racer, knocking her out. Captain America saw Black Racer and several other Serpents hauled away by Guardsmen. (Captain America IV#30) - Black Racer was present in the Society's underground New York-area headquarters when Captain America and Diamondback (really an LMD) awoke, chained to a pillar, after having been captured by other members of the Serpent Society. (Captain America IV#31) - Black Racer was there while King Cobra taunted Diamondback, promising to punish her for her betrayal. 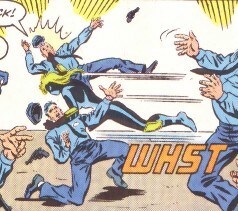 Sixteen hours later, Cap escaped; King Cobra summoned the rest of the Society and Black Racer was one of many to respond; she was knocked out by the Diamondback LMD. S.H.I.E.L.D. subsequently took Racer and the rest of the Society into custody. (Captain America: Sam Wilson#4) - Diamondback lured Captain America (Wilson) into a trap set up by Serpent Solutions, the rebranded Serpent Society. After they were nearly run over by a truck Black Racer, Copperhead and Cottonmouth jumped out of the back of the truck and attacked him. Cap and Diamondback held their own against the three snakes until Black Racer seemingly stabbed Diamondback in the gut. Despite that Cap knocked out the three snakes and Diamondback was forced to stab him with a poison tipped diamond to defeat him. Black Racer was later at a meeting of Serpent Solutions in a conference room with Captain America (Sam Wilson) as captive. Captain America, who had temporarily been turned into a wolf/human hybrid, had just been captured by Serpent Solutions members Black Racer, Copperhead, Cottonmouth and Diamondback. (Captain America: Sam Wilson#5) - Black Racer was present when Viper (Dixon) monologued to Captain America (Wilson) about how Wilson was destroying America and Serpent Solutions' businesses. Viper ended the monologue by shoving Cap, who had been paralyzed by Asp and was bound to a chair, out a window. He was saved from certain death by the new Falcon (Torres), who was then confronted by Serpent Solutions, including Black Racer. (Captain America: Sam Wilson#6) - Serpent Solutions went after Falcon (Torres), but eventually everything went wrong. Falcon survived a bite by Cottonmouth, Diamondback turned on them, Misty Knight and D-Man joined the battle and Captain America got back on his feet again. Their defeat on Wall Street at the hands of the heroes caused their stock to drop and bankrupt Serpent Solutions. Comments: Created by Mark Gruenwald (writer), Tom Morgan (penciler), Dave Hunt (inker), Ralph Macchio (editor). Comments: Black Racer appears to have a little of Puff Adder's "what skin color am I again?" action going on. She's white-skinned in Captain America I#337 (see left), and black-skinned in Captain America I#379. I'm assuming the latter to be correct and the earlier to be a disguise, though there's something in me that hates the apparent "if she's the Black Racer, she must be black" reading. Future writers could just as easily decide the other way; this is an open question. Maybe King Cobra acquired one of the X-Men's image inducers; Black Racer was using it (she's white-skinned if so) in #379 so that she wouldn't be recognized by Diamondback, and Puff Adder just loves to play with the thing constantly? She received a last name in OHOTMU A-Z HC#10 in the Serpent Society entry. Thanks to Ron Fredricks for the cleaned up main.